The two pictures show staff members of Carndonagh College in the Colgan Hall, top, and Convent of Mercy, below. The photos first appeared in INIS DÚINN, 1972, when the second edition of the school magazine was published. It ran to 52 pages and included contributions by students called Paul Fiorentini (Moville) and Paddy Doherty (Dunaff ) among others. Paul is the current Principal and Paddy taught Irish for many years. John O’Kane, (Culdaff) wrote a poem called TRAMP and Deirdre McGrory (Culdaff) wrote a poem called VOCATION. Carmel Lynott provided make-up tips. By 1972, both schools had amalgamated with a total school population of about 400. In September 1973, the two schools joined the Technical School to form Carndonagh Community School, one of the first ten established in Ireland and funded by the World Bank. Of the college staff, four have passed away – Fr Gallagher, Fr McKenna, John O’Leary and Evelyn Beattie. Of the Convent staff, four are deceased – Helen O’Reilly, Sean McDevitt, Sister Margaret Mary McKinney and Mrs Farren. The idea for the school magazine came from Fr McKenna in 1971. He had been a teacher in Maghera before he came to Carn College as Headmaster in 1971. Maghera had a magazine also and they included photos of all pupils and staff. Thanks to Fr McKenna, photos were published of all students thereafter except for a break in the 1980s. They can be seen today in the school corridors. Of the College staff, Veronica McLaughlin is currently School Secretary and Fr McGoldrick is PP of Fahan. Fr Lagan became a Bishop, and was the first Guidance Counsellor in the school. John O’Leary had a great knowledge of History and English and never used text books. He came from Cork and his brother was Professor of Political Science in Queen’s University, Belfast and a published author. Jim Quigley taught Geography and was mentioned in a poem by one of his pupils who became a famous dramatist, Frank McGuinness. Andy McNelis taught mainly Irish as did Evelyn Beattie, who also taught English and Religion. Brian Gormley taught Maths and Colm Toland taught Science and Maths (and Gaelic football outside class time). I taught English, History and French (the latter for one year). In 1984, I was appointed Guidance Counsellor. Fr McKenna taught Latin for a short time before he became Principal. Fr Gallagher taught Irish. When the two schools amalgamated in 1972, teachers had to travel between the Convent and the Colgan Hall. Fortunately, speed cameras had not been invented. In 1973, the Community School was not ready for students, so classes were still held in the old buildings. Overcrowding was so bad that some classes were taught in a Lough Swilly bus parked outside the Tech. That experiment was not a success. In 2023, CCS will celebrate 50 years. 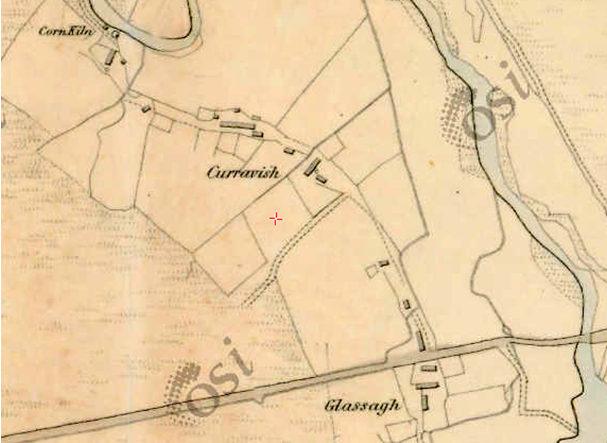 Corvish Stone – the CLOGH FAD 1834? 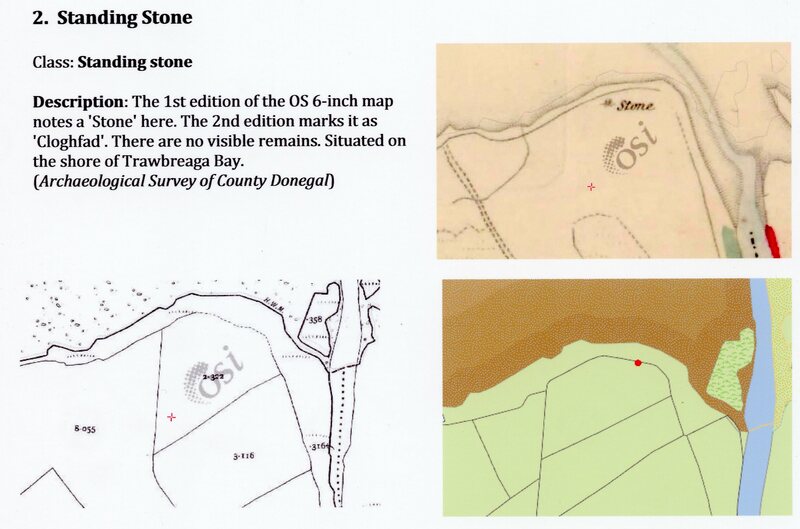 The OS maps reveal more information about the Corvish Stone which was discovered recently. 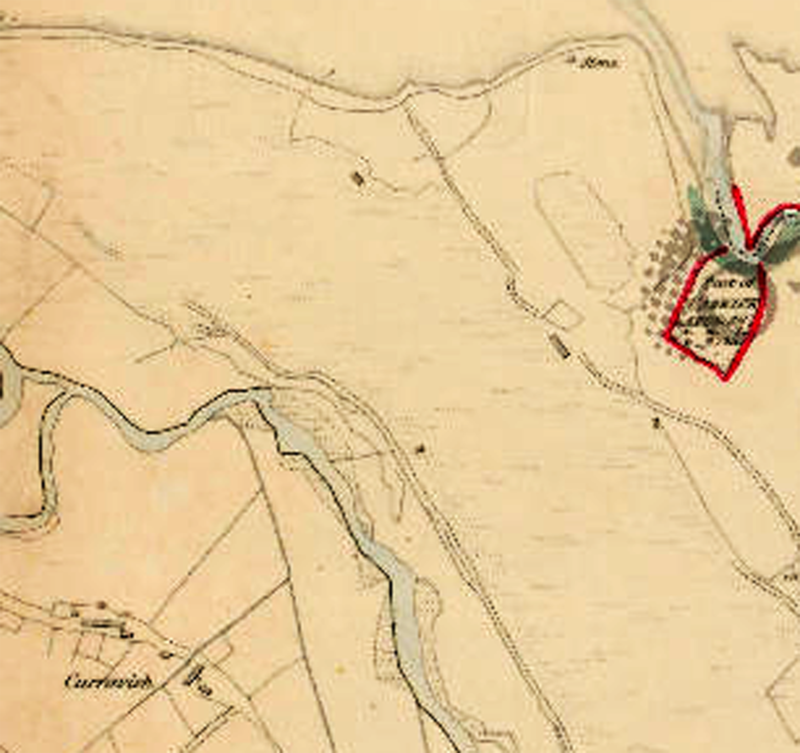 (See earlier post) The first edition of the OS 6-inch maps 1834 shows a “Stone” here but it had disappeared in the 1900 edition. The stone with the carving is most likely the original standing stone listed 200 years ago. Clearly, it has undergone a process of recycling. Thankfully, it was not used as a door lintel or in land drainage, as was the fate of many of our standing stones. I assume the McLaughlin family recognised its importance and preserved it behind the house, where it was found. The Corvish Stone is an important part of the heritage of Carndonagh parish. Thanks to Maura Harkin for the maps. See DONEGAL IN TRANSITION ( S. BEATTIE) for more information on the kelp industry in Carndonagh. The inscribed stone at Corvish, Carndonagh was noted in 2019. It is like a standing stone roughly six feet long and one foot wide. It may have originally been a standing stone. There is an illustrated panel on the centre with a carved line running along the entire side. A beautiful inscribed panel frames the memorial, thus indicating the work of a local stone sculptor and recalling similar panels on the High Crosses. The words IHS are at the top of the panel, and suggests a head stone or perhaps an altar stone that was in use in Penal times in the early 1700s. Similar inscriptions can be seen at Cloncha graveyard, dating from the 1700s. Altar stones were placed on Mass rocks and carried from place to place as priests tried to evade the Redcoats and their spies. A local family took care to hide the altar stone. There are several stories about Mass rocks and priest hunters seeking a bounty from this area so the stone is of great interest for these reasons. The main Mass rock of Carn is close by and signposted on the Ballyliffin road. The original date appears to be 1820 but the digits 19 appear to have been added later thus giving a reading 1918. Thus the stone appears to have had several lives which adds to the mystery. The Corvish Stone showing the IHS inscription and the OML in the right corner. The stone had several lives – pagan standing stone, Penal Laws altar stone and memorial headstone. The stone lies at the back of a wall stead owned by McLaughlins and the inscription on the left is OML, suggesting Owen McLaughlin? The house row at the back of the picture is often found in Inishowen clachans. A similar row of houses stands at Ballyharry and is known as “The Row” and on Ballyliffin golf course. 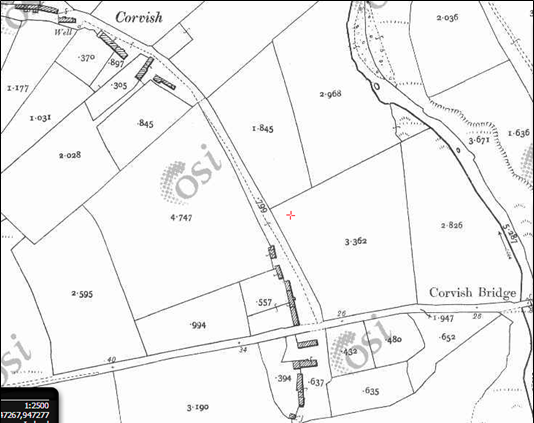 The houses are deserted but belonged to Mclaughlins (James), Dohertys (Nochars) and Kearneys. There was also a McColgan family, the name of the Erenaghs of Donagh (Bell Keepers). There appears to have been another row of houses on the row entering the site. Estimates for population are around 100 persons in 1901 living in the clachan. Thanks to Mickey McClure, Benie Logue and Stephen Logue, who first alerted us to the stone and assisted with identification.